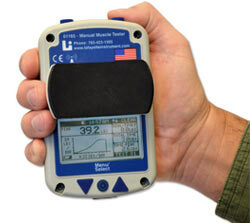 The Lafayette Hand-Held Dynamometer (formerly known as the MMT) is an ergonomic hand-held device for objectively quantifying muscle strength (force measurement). The test is performed by applying force to the subject's segment. The objective of the test is to overcome or "break" the subject's resistance. The HHD records the peak force and the time required to achieve the "break" providing reliable, accurate, and stable muscle strength readings that conform to most testing protocols. The HHD comes with 3 stirrups, user's guide, battery charger, and carrying case. 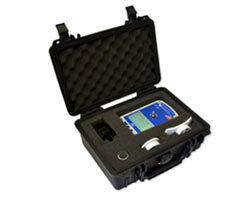 Software that allows easy download of the stored values from the Model 01165 Hand-Held Dynamometer to your computer via a Bluetooth connection. The software is capable of displaying peak force, average force, time to peak, test date and time and force over time data. Free updates are available with an internet connection. Set of 25 replacement sanitary covers for the Model 01165 Lafayette Hand-Held Dynamometer.